Silencer Shop distributes silencers. AKA suppressors (aka firearm mufflers). A lot of them. In fact, Silencer Shop is responsible for about 50 percent of all Form 4s filed in the U.S.. If you’re local to the Austin, TX area there are a couple other services that Silencer Shop can provide you, and that’s where our “thank you” comes in . . .
Did you know that Silencer Shop transfers nearly all of TTAG’s review guns? If you’ve read a gun review on here in the last year, chances are that loaner firearm passed through Silencer Shop. A service they provide to TTAG at the rate of zero dollars, by the way. A couple weeks ago I was in there to pick up five firearms — yes, the ATF calls Silencer Shop every few months specifically to inquire about yours truly — and they were packed with customers. Tight on time (I popped in on my way to a meeting) and thinking I should just leave and pick up the guns another day, their COO came in from the back offices to provide reinforcement to the counter staff and I got out of there in just a few minutes. Their electronic 4473 system makes transfers quick and easy, too. While the no-charge transfer thing is a much-appreciated favor that Silencer Shop provides TTAG, they do firearm transfers for any Texas resident. Their normal going rate is just $20, which is well below average. Most people don’t realize this, but Silencer Shop doesn’t actually retail (sell direct to the customer) any suppressors at all. They’re strictly a distributor that sells through their retailer network. If you’re an FFL thinking about selling silencers, becoming a “Powered By Silencer Shop” dealer is, by far, the easiest and most efficient way to do it. For the consumer, whether you take advantage of Silencer Shop’s professional assistance over the phone, order and pay directly through their website for transfer through a Powered By dealer near you, or go direct to your local dealer from the get-go, the experience will be as streamlined as possible and that local dealer makes the same margin regardless. If you’re in the Austin, all of your paperwork, fingerprinting, photos, trust, tax stamp, and Form 4 submission can be handled at Silencer Shop HQ. Silencer Shop’s S.I.D. kiosks make this whole process as fast and easy as it can be. To find a local dealer with an S.I.D. kiosk, simply use their Class 3 Finder to search your zip code and look for a dealer with the fingerprint icon next to their name. Kiosk or not, though, your local “Powered By” dealer can get the job done. Finally, I’d like to thank Silencer Shop for putting me on their SOT. That’s what allows me to borrow suppressors to test out for TTAG reviews (and sometimes SBRs and other NFA items), which I’ve been trying to do approximately monthly since late 2016. What does Silencer Shop want from me? Honesty. Not only are they accepting of The Truth About Guns doing what The Truth About Guns does, even for the products they sell, but they literally had me sign a piece of paper stating that I’d be borrowing suppressors for the express purpose of producing unbiased, honest reviews of them. 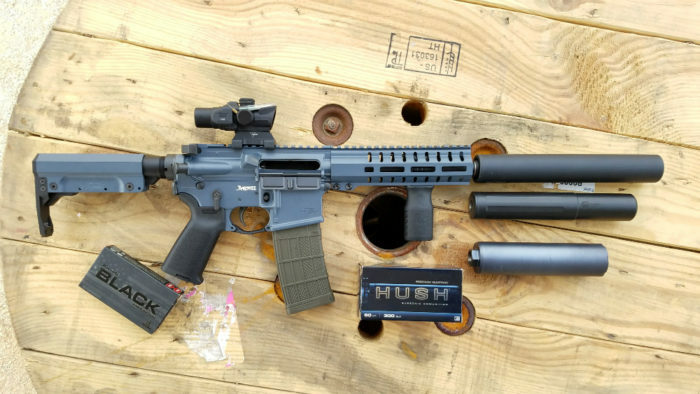 As they sell a huge range of suppressors from many brands, Silencer Shop’s concern is helping their customers choose the right one that the customer will be most happy with. How happy? Money-back guarantee happy. Yes, even after your Form 4 has cleared and you’ve owned the suppressor for up to 90 days, you can return it for a full purchase price credit to Silencer Shop. Anyway . . . just wanted to give them a shout-out and say thanks to Silencer Shop for all of the firearm transfers and for making it easy for TTAG to get and review NFA items. hopefully i can afford one, someday. but then again, thats not the american way for companies. all about the money. You should be able to build, make or modify one because that is the REAL American way. If it’s a factory one modifying it isn’t really an option unless you want to pay the tax again. ATF has been pretty clear that making parts for suppressors is something that requires a form 1 or an SOT, even something as minor as wipers. Get rid of the ~20%-100% tax on them (depending on model) and it becomes a lot more palatable doesn’t it? Then again that’s not the American way either since 1934. Not only that, but the elimination of the tax and wait will likely drive down the retail costs as well due to volume of sales increasing. You can easily make one yourself with just a drill press. Look up the form 1 suppressor forums and sign up. It’ll tell you how to make baffles and some tips on building a suppressor, plus they’ll answer any questions you have. You can make a suppressor a lot cheaper than buying one, and Form 1’s are approved faster than form 4’s anyway. absolutely senseless delays. You feel you can’t afford the item, and you blame the company. Q: For the company, what other way is there? What would your way be? Nice to see business hopping in there. I like seeing any gun-related company having such a busy day the management needs to get off their butts to help. Why are you skeptical? Just curious. Eric in Oregon, I’ve heard that at places that do electronic 4473s send them to ATF as a way to track who bought what. but thanks to Jeremy, i now know that i didn’t have to worry about Silencer Shop’s method. FWIW these don’t even leave Silencer Shop and they aren’t stored electronically. It’s just a really easy way to input your info — done on the kiosk you can swipe your DL to auto-fill most personal info fields — and then they print it on paper for you to sign for the files all FFLs are required by federal law to keep. In Texas, if you have a CHL the dealer doesn’t have to do a NICS check, so the 4473 info, as mentioned, never even leaves the store. I’ve grown quite fond of Silencer Shop, especially after using one of their kiosks for my Ruger SR-ISB (still in NFA jail). I always get a chuckle remembering one FFL in Auburn, AL that complained unceasingly about them and had a store policy that any suppressor distributed by them to that store would incur a %15 upcharge because Silencer Shop ‘was ruining the business for everyone else’. Yes, back in the day when Silencer Shop was selling retail they were hard to compete with on pricing. Well, partially that but also a big part of it was that the entire industry was accustomed to selling silencers at nothing other than full MSRP and it had been that way for decades. Someone coming in and treating these things like any other retail item and selling them at sub-msrp prices at more typical retail margins was not well received. I agree 100%. I’m glad the industry changed for the better because of SS’s competition. Oh, and that particular store had a $150 item transfer fee as well. If the item came from SS, they charged the transferee 15% of msrp of the item ON TOP of the $150. Needless to say, I found other places to give my business. Some of the procedures could be better explained for an NFA novice, but overall I had a good experience. Now I’m just playing the waiting game. So there’s now a couple of shops near me with kiosks. They’re great – no more waiting around the PD on the one day that they deign to do fingerprints – but they tend to be under-used. Once you do your prints, that’s it – you’re done and don’t need the kiosk again. To me it would make more sense for them to rotate the kiosks through their different affiliated dealer locations. I haven’t used them but my next muffler purchase will probably be through them. I’ll have to comparison shop them against my local guy though. My local guy runs his business out of his house (it’s legal) and somehow has most of his competition beat on prices, and beaten BADLY like hundreds of bucks per item IME, looking at his prices on MG’s he beats most of the competition by thousands. I really want to know how he’s doing it. Of course I need to redo my trust first… or set up a new one or new ones. Thanks Obama! Eh, I kept my trust the same since we’re in a post 41f world. SS kiosks make getting prints 1000x easier than going down to Metro here in LV. With the kiosk, I don’t see a benefit to reworking the trust. The last couple cans I’ve transferred have been on Silencer Shop “One Shot” trusts. The idea is a new trust for every new NFA item. One item, one trust. This only matters if you have other people you want to add to your trust (my wife, in my case). Every time you add an item to an existing trust with multiple people on it, everyone has to submit new photos, fingerprints, and the whole rigmarole. But if you add a new person to an existing trust, they don’t have to do that stuff. So I bought a new suppressor on a new One Shot trust. I’m the only person on it. Once the Form 4 is approved I’ll amend the trust to add my wife. As she has no interest in ever actually using the items and is only on the trust in case of accidental “possession” (e.g. I’m out of the house and she knows the combo to the safe or she takes the car to a store and my range bag was in the trunk with a suppressor in it), she would be quite annoyed with me to have to take the time to go get fingerprinted and photographed every time. Fair enough. The one-shots are interesting in that aspect. I’ll have to consider them for future items. I was under the impression that the ATF has not really defined/decided how adding people to trusts would work yet, so I just added to my existing one. Good to know I was mistaken.